Rain has plagued Barber Motorsports Park throughout the day on Sunday and it is now to the point where the track is unrecoverable for the day and rainfall is still occurring. The Verizon Indycar Series race control has made the decision to stop the race after 22 laps of the scheduled 90. As of the weather station located on the roof of the race control building, we have received almost 0.40 inches of rain throughout the day so far (as of 5:00 PM). Looking at the forecast for Monday, we’ll have mostly cloudy skies once again at the track with a chance of a passing shower or two. The good news is that rain chances are much less than today, but high enough that rain tires may be needed again. Forecast models are varying on the rainfall for Monday… from none at all by the NAM, to a very small amount by the GFS, to a higher risk of rain by the European. At this point, we’ll go with 50/50 odds. The temperature to start off the day will be in the upper 50s and the afternoon high will top out in the upper 60s. Winds will be out of the south-southwest at 5-10MPH. If any rain falls at the track, it should only amount to less than 0.15 inches. 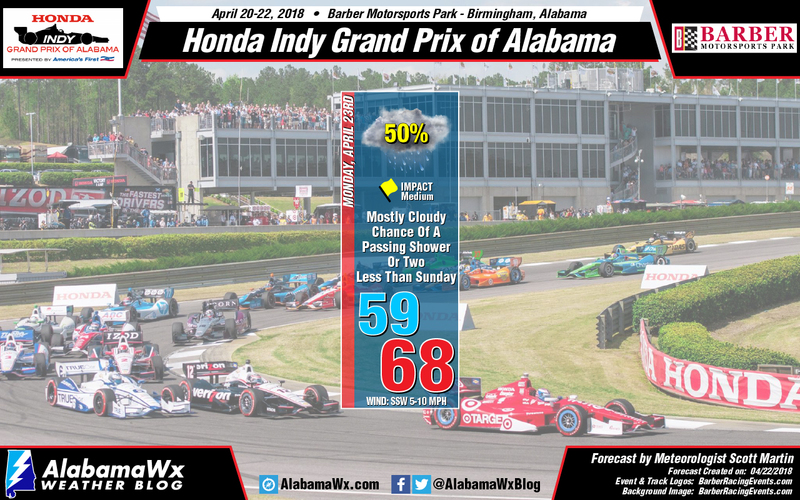 We have a forecast page set up on the site that will be updated throughout the week leading up to and during the 2018 Honda Indy Grand Prix of Alabama weekend on April 20-22. You can check it out here. Get your tickets for the 2018 Honda Indy Grand Prix of Alabama at the Barber Racing Events website. Kids 15 and under admitted FREE with a ticketed adult, courtesy of Alabama Power.